The EU deals with 320 million third country nationals every year, immigration officials, according to FRONTEX, needing only 12 seconds to make a decision on their entry. So why the crisis? Refugees arrive in boats on European shores. Ben White/ CAFOD. Flickr. Some rights reserved.The images of refugees fleeing war zones and seeking any means to enter territories more stable than where they came from accompany violent conflicts wherever they take place in the world. The images of refugees fleeing to Europe from the regional war in Syria and Iraq have been particularly poignant in 2015. The stories of the paths of flight, across Turkey, over the Aegean sea to a Greek island, from the island to the Greek mainland, from there to the Macedonian border and then across Macedonia and Serbia into Austria, possibly passing through Hungary, Croatia and Slovenia are extraordinary. People have been reaching for maps of Europe to figure out what is going on. Everyone is concerned and anxious about the fate of the refugees, but policy makers in a number of Europe’s states have also been concerned about the consequences of arrivals of substantial numbers of refugees in their country. They have been shamed by the German response of welcome. In some cases, policy makers and media in a few member states seek proof that the German welcoming response was a mistake. One of the most startling and unanticipated outcomes of the rather erratic way in which refugees have been moving across the European continent has been new stresses on the Schengen free travel area comprised of 26 states, mainly Member States of the European Union (except Bulgaria, Croatia, Cyprus, Ireland and the UK) but with a few EFTA states (Iceland, Liechtenstein, Norway and Sweden). Among these states no border controls on the movement of persons is permitted except under very exceptional and regulated circumstances. Yet, eight Schengen states (Germany, Austria, Slovenia, Sweden, Norway, Denmark, Malta and France) reintroduced limited border controls starting with the Germans on 13 September 2015. One state has lifted those controls, and an EFTA state, Norway has introduced a few controls. With the exception of France the controls are limited to very specific border crossing points. Rather surprising in the list of countries are so many Nordic ones – far from the Turkish or Libyan borders – apparently the century old Nordic Union is crumbling under the pressure of Europe. The rules of the Schengen area require any state seeking to reintroduce border controls with another one to give reasons for this. According to the first notification of the reintroduction of intra-Schengen border controls made by the German authorities on 13 September 2015 the reason for this extraordinary measure was: “In view of the uncontrolled and unmanageable influx of third-country nationals into German territory…” (Council Document 11986/15). In the detailed justification requested by the Commission, the German Minister replied on 29 October, “I would also like to reiterate that the situation in Germany mainly depends on the measures taken by the responsible Member States to protect the EU’s external borders…transit countries within the Schengen area seem to be unable or unwilling to take the measures required by EU legislation to register and check each and every migrant.” (Council Document 13569/15). The justifications given by the other Schengen states for reintroducing border controls mirror the German ones. The Austrians speak of a “massive influx” which is not their responsibility. (Council Document 13127/15). The Swedes mentioned “unprecedented migratory pressure” (Council Document 14047/15). The Norwegians were concerned about “unpredictable migratory pressure” (Council Document 14633/15). The Danes complain of “unprecedented migration pressure”: the Maltese the global terror threat, and the French their state of emergency. One aspect common throughout most of the justifications for border controls is the massive, unpredictable movement of third country nationals into and across their states. The constant complaint is that some other state should be responsible for these people. Someone should be registering them and taking responsibility and that someone is another Schengen State, not the one where the third country nationals have arrived. The call is one for more and better surveillance of third country nationals entering the EU. But this is a very selective call for surveillance. FRONTEX, the EU’s external border agency, has stated that the EU welcomes over 320 million third country nationals a year who are subject to border checks to determine their eligibility to enter the EU. Each year only about 150,000 people are refused entry at the EU’s external border. Those 320 million third country nationals who enter the EU every year can travel freely around the Schengen area, only ever encountering one checking on entering the area and one on leaving. That check, according to FRONTEX, takes an average of 12 seconds. They can stay for three months as tourists. According to FRONTEX’s report on 20 January 2016, in the third quarter of 2015 (the period of the most frenzied media pictures of refugees fleeing across the continent) 405,131 people applied for asylum in the whole of the EU. This was a substantial increase from the second quarter which saw 210,932 asylum applications. But it is perhaps not the massive unpredictable influx claimed. Further, in comparison with the normal massive uncontrollable influx of 320 million third country nationals annually it does not seem too large. The question must then be asked, if the EU can deal with 320 million third country nationals every year without any crisis and immigration officials, according to FRONTEX needing only 12 seconds to make a decision on their entry, why do we have a crisis over 405,131 asylum arrivals in the third quarter of 2015? 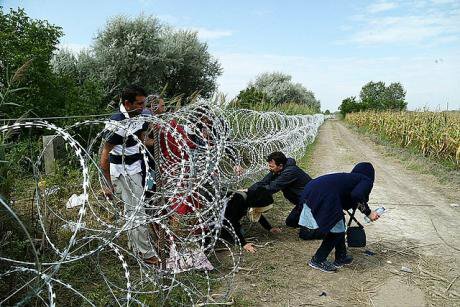 Syrian refugees cross into Hungary underneath the Hungary–Serbia border fence, 25 August 2015. Wikicommons/Gémes Sándor/SzomSzed. Some rights reserved.The pictures are heart-rending. Notwithstanding claims that the vast majority of the arrivals are young men, according to UNCHR’s statistical yearbook 2014 the demographic make-up of refugees in Germany was 41% women and in Switzerland 44%. UNHCR did not have figures for the UK. In Germany and Sweden officials are concerned that refugees who have arrived recently in those countries will be seeking family reunification quickly with loved ones left behind in Syria, Turkey or elsewhere. If these applications are dealt with expeditiously then the percentage of women in the refugee population is likely to rise quickly and possibly overtake that of men. 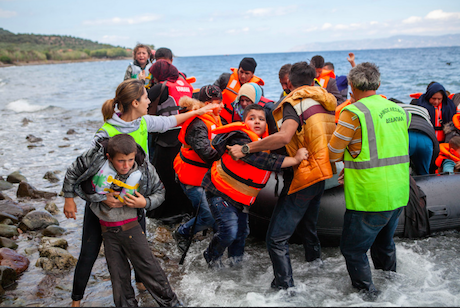 Refugees generally cannot arrive in Europe in the same way that tourists do. Virtually all of the top five asylum producing countries for the EU are on the visa black list (the exception is Albania). These are: Syria, Afghanistan, Iraq, Albania and Pakistan (according to FRONTEX 20 January 2015). There are EU and/or national sanctions on carriers such as airlines and ferry companies of €5,000 at least for each passenger they bring to the EU without proper documentation (including a valid passport and visa). There are no EU delegations open in Syria which issue visas. There are no EU delegations open in Syria which issue visas. So instead of paying the €30 which EU citizens hand over for a day trip from the Turkish coast to the Greek islands or the other way around, Syrians have to pay smugglers according to latest calculations more than US$ 1,000 per person for a dangerous and sometimes fatal trip. This is simply because no authorised carrier will accept refugees without passports or visas or both. The consequence is that instead of refugees arriving in a safe and well-organised manner on ferries or flights to ports or airports where there are immigration officials available, and infrastructure such as trains and buses into cities etc., they arrive unexpectedly on strange islands with little or no infrastructure to assist them. As, by and large, they want to be somewhere else other than on a Greek island, they then take tortuous routes through the Balkans, often at further physical risk to arrive where they want to seek international protection. These routes are usually not the normal ones – trains and flights – but include numerous trips across borders on foot, using buses dragooned in by local authorities to ensure that the refugees keep moving. Some authorities have established obstacles of all kinds which only contribute to the irregularity and uncertainty of the places of arrival. They could be treated as special guests who bring their own resources both financial and professional. The anxiety expressed by EU governments which have reintroduced a limited number of border controls within the Schengen area that there are uncontrolled and massive influxes of refugees (or migrants if they are using that term) is the result of their own actions. These refugees would arrive regularly and with much more money in their pockets to help them settle (often temporarily until they can go home) in their new refuge if they could catch a flight to their host destination. They would also then arrive directly in the country where they wish to seek asylum. Instead of forcing refugees to suffer the insult of submitting to smugglers and then treating them all as destitute and objects of complete control (housing in collective reception centres, often in former barracks, collective food provision etc.) they could be treated as special guests who bring their own resources both financial and professional. Perhaps they do not need to be treated exclusively as objects of surveillance and registration but as people ready to make a contribution to Europe who should be offered the opportunity. There is an excellent example of just such an approach to substantial numbers of persons arriving and needing refuge in Europe: the Polish response to the arrival of over 1 million Ukrainians over the past three years. Instead of forcing them into the asylum procedure, the Polish authorities, according to the EU statistical agency EUROSTAT, have issued more than 100,000 work and residence permits to Ukrainians over each of the preceding three years. The Czech authorities appear to have followed a similar approach, though the numbers are substantially lower. If one remembers the fears of mass influxes from earlier periods – the 2007 accession of Bulgaria and Romania to the EU, the lifting of work restrictions on Bulgarian and Romanian workers on 1 January 2014 and so forth, the reality never reflected the nightmare scenarios sold by the purveyors of fear. Perhaps we should have more confidence in people, both our own and those in need of international protection and contemplate how best to provide them with durable protection for as long as they need it before hostilities in their own countries cease and they can return home with dignity. It may be something of a surprise to reflect on the good example which the Polish authorities have provided to the rest of the EU.